If entrepreneurs are the lifeblood of an economy, consider Inc.’s ranking of 5,000 companies America’s circulatory system. Inc 5000’s annual report looks at the fast-growing innovators. To qualify, companies must have been founded and generating revenue by March 31, 2014. They must be U.S.-based, privately held, for-profit, and independent–not subsidiaries or divisions of other companies–as of December 31, 2017. 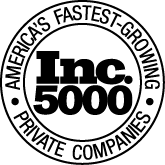 There’s fast growth–and then there’s Inc. 5000 fast growth. Collectively, the companies on this year’s list amassed $206.2 billion in revenue in 2017, up 158 percent from $79.8 billion in 2014. The fastest-growing companies in America are a force, notching collective revenue of more than $206.2 billion in 2017 and three-year revenue growth rates that top out at 75,661 percent. Companies on the 2018 Inc. 5000 are ranked according to percentage revenue growth from 2014 to 2017. We are so proud to be part of the Dallas 100! Co-founded by the Caruth Institute for Entrepreneurship in 1990, the Dallas 100 Awards is an annual event that identifies and honors the 100 fastest-growing privately held companies in the Dallas Area. For 27 years, the Caruth Institute for Entrepreneurship at the SMU Cox School of Business and the Dallas 100 sponsors have celebrated the innovative spirit, determination and business savvy of area entrepreneurs. We have saluted the diversity, creativity and resolve it takes to create and sustain a successful business in today’s competitive environment. Are independent, privately held corporations, proprietorships or partnerships (not subsidiaries or divisions of a parent company). Had sales of more than $500,000, but less than $75 million in the fiscal year, and; Have a three-year sales history which reflects growth during the three-year sales period.